Louie is the founding partner of Potent 6 and creator of ‘Inspiring Leaders’ which is both an extraordinary learning journey for leaders and the name of a new social business whose purpose is to bring opportunities for leadership development to those who can’t normally access it. Uniquely working across the spectrum of experienced executives, top-teams and high potential, aspiring leaders within organisations and communities, Louie creates a context that supports all to self-empower. She enables and encourages people to willingly extend and transform themselves; whilst supporting them to bring about the necessary changes to systems and processes to support desired personal, organisational and community outcomes. Louie has a undeniable passion and talent for enabling people to work collaboratively through complex, challenging situations. She brings clarity to situations and shares her 6 ‘P’s‘ of leadership with the3rdi magazine over the coming months!. For those of us who have been working in and supporting local government and the health sector for decades, we could be forgiven for thinking that we have heard much of Cameron’s proposition before. Notions of delegation and devolution have been around for many years but hardly ever does the rhetoric and good intention actually translate into transformed realities – not because there isn’t some desire to do it but because when people use the words delegate, devolve, engage they do not actually appear to understand what that means – what it means in practice and what it means in terms of who has what power; who is willing to ‘let go’ of some and who has power that they are currently not recognizing, not using or indeed may be abusing. “There are the things you do because it’s your passion,” he said. He is talking not only about his PASSION but his sense of PURPOSE in making a difference to ‘his‘ country; and when he talks about building the ‘Big Society‘, it seems he has in mind a Vision of how he wants his country to be. I believe that Blair’s government believed in community leadership and there was recognition that it takes resources to catalyse change. Perhaps inevitably, the source of the necessary resources differs dependent on philosophical and political perspectives not surprising that a conservative politician will cut public expenditure and look for ‘free‘ cash elsewhere…. Cameron confirmed plans to use funds stuck in dormant bank and building society accounts to enable “some of the most dynamic” charities, social enterprises and voluntary groups to take over the running of public services. However, money alone is not power – it is how it is deployed that turns it into power that will determine any real possibility of transformation. More than money, it takes constancy of Purpose over time. Inherent in any collective Government (national or local) thinking is its motivation to hold on to its power to govern. Their sights are set on re-election and their actions are driven by seeking quick wins to secure the following of the electorate. The actions to create quick wins are usually short-term in nature; and being short-term, are more often than not, determined not through collaborative enquiry, but by the ‘powers-that-be‘ deciding more or less unilaterally through their electoral Manifestos and Policies, what is to be done, how and when. They may invite others to engage with them on their agenda – but it is always on the dominant power-holder’s own terms. When I decide to hold a birthday party – I determine what I want it to be like; I set the date; I decide who to invite; I say where it will be, what time guests may arrive etc. and in the myriad of all my decision-making I delude myself that I hold all the power. I forget that without my guests, I have no party – no one with whom to celebrate; no one to bring in their energy and unique personal contributions to make the occasion one I would want to be remembered for all the right reasons. I forget that they have THE power to show up or not; they have THE power to bring the best or worst of themselves; they have THE power to undermine/ lobby against or champion attendance at my party. They have the power to choose to follow my lead or not; in choosing whichever course of action they choose, they are in effect leading themselves. Whether or not people perceive they have the power to choose to engage; they have it. In this little scenario, what I am pointing to is that I believe there to be a common flaw in both the current and previous government’s understanding on what, in reality, it might take to transform our broadly dependent national culture into an ’empowered’ state. There appears to be an underlying assumption that enough ‘people’ will be willing and able to step into and embrace Cameron’s call to create our ‘Big Society‘. When policy-makers talk about empowering others, they are talking from the perspective where they believe they have power to ‘give power’ to those who don’t have it. If this were fundamentally true, then paradoxically, those without ‘power’ would never fully be empowered because someone else would always have the right to take their power away. in the next election, for example! To illustrate the point – the new Government intends to shut down the Regional Development Agencies set up by the previous incumbents as part of their intention to ‘devolve’ powers regionally and locally. If these powers had been truly ‘devolved’ then those that originally enacted the devolution, in theory, would not be able to ‘take back’ the power. If Central Government retain the ‘power/ right’ to reclaim power, then ‘devolution’ will not in fact happen – technically it would actually be a form of ‘delegation’. The casual use of such terms, either out of clumsiness or ignorance, creates considerable confusion at best, and dashed expectations, break down of trust and withdrawal of contribution at worst. In the above example, I am drawing out a distinction between ‘power‘ and ‘powers‘. The government has powers to effect changes within our legal and constitutional framework. But those powers are only afforded any power because individuals and collections of individuals agree to play by the rules/ norms/ code. Playing a game of hockey is possible because everyone agrees to play within the markings of the pitch, follow the same rules, use the same equipment, have the same number of players and abide by the decisions of the umpire. If each person on the pitch decided to opt out of the rules of the game, the umpire’s powers would be useless rendering them powerless ie having no power to instruct the individual players to do anything. In other words an umpire only has power by the consent of the players. So, until I recognise that no one can make me do anything – until I recognise that I choose my actions based on the consequences I am willing to accept – I remain blind to the enormous power I have. I choose to follow the laws of the land or risk being punished if I break them and am caught doing so. My ability to exercise the full range of choices available to me would be greatly limited if I were put in prison but how I choose to engage with my prison sentence is entirely within my gift. Nelson Mandela had his physical movements constrained in his 25 years on Robben Island but he remained a powerful, liberated man because of how he used his personal power – his mind and his actions within the confines of his incarceration. So when David Cameron talks about ‘People Power – activism, volunteering and philanthropy‘, I find myself wondering what he understands about how to create the kind of cultural shift that would be required for the UK to become a Big Society. For those of us who have experienced working in and with communities; and in and with teams in organisations, we know that the journey from dependence to interdependence can take years of personal and professional development facilitated and enabled by passionate, committed, compassionate, purposeful individuals. There simply is no quick-fix. Mandela, becoming the first ever black President of South Africa did not magically transform the Rainbow nation into a healed, vibrant society of empowered, happy people. Mandela inspired hope and a sense of possibility; but without his constancy of Purpose, without his clarity of vision and values; without his wisdom, deep principles and leadership beyond ego, South Africa, named as one of the most violent countries on the planet, finds itself to be a nation struggling to recover and heal from the legacy of apartheid ; and with a leader who is not of the same calibre, integrity, maturity or wisdom as Mandela, I find it hard to imagine the shape of the future to come. 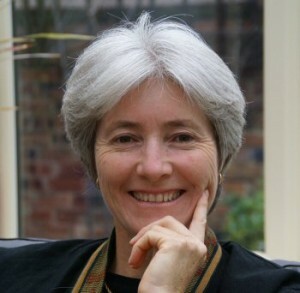 Whatever the degrees of dysfunction in a ‘system’ – be it a family, community, team, organisation or nation – more is needed over a much longer time-frame to create the conditions for fundamental healing, self-empowerment and transformation; and some of that ‘more’ has to include a focus on the learning and development of individuals. Quite apart from our global concerns, the human complexities with which we have to contend are many: everyone is at a different stage in their own personal development and evolution, there are different values, perspectives, histories, expectations, awareness, skills, needs, abilities, beliefs, religions, philosophies. The crucial point I am positing is that the key to making any progress in our Big Society is to awaken people firstly, to the enormity of the power they have; and secondly to enable them to begin to consciously use their power wisely, not only to make their own lives more fulfilling, but to support others to do the same, for the common good. * It takes longer than an election cycle to create lasting cultural transformation of the order Cameron is talking about – it will take decades, if not generations – our party political system works against the kind of unity required to create suitable conditions. * There is no simple formula to creating the Big Society eg. ‘hand over the running of public services to charities, social enterprises and voluntary groups’. It takes a more systemic recognition of the scale of the challenge; it takes mutual understanding and appreciation not only of current and potential partners, players, people; it takes a different enquiry about the nature of the power that each has available, as well as a curiosity about their vested interest (ie what is ‘in it’ for each of them to effect change rather than maintain the status quo); and then it takes a willingness to engage by enough people to create the tipping point into a new way of being in society. Change will not come from an enlightened individual. The challenge is: how to grow enough of us, who are aware enough, to generate critical mass. * It is old paradigm for a Leader to come in with a Vision and try to sell it to others. The challenges of our nation, and indeed the world are so complex; and the factors at play so infinite and unknowable, that the only way to stand a chance of transforming in a more sustainable direction, is to start working with the ‘system’ as a whole. This means embracing the complexity of our situation rather than pretending things are simpler than they are. It means adopting ‘whole systems’ approaches and drawing on the principles of complex adaptive systems and in particular, something like Human Systems Dynamics. It means people entering into a space of shared exploration as partners with differences, yet with ‘equal’ stake in a mutually beneficial outcome. * To evolve and take action towards a shared Vision takes real partnership and this means power-sharing and decision-making borne out of a process of dialogue (the Greek derivative of which means ‘making meaning together’) rather than ‘debating’ or ‘discussing’ (the origins of which both mean ‘to beat down’). It means entering the space of collaboration, without thinking we know the answers about how it should be, and being willing to discover ways forward together without trying to control or manipulate the outcome or direction of travel. Synchronising Power around a Unifying Purpose – the Difference that might make THE Difference – change the way of politics! So, if David Cameron really wants to make a difference, I suggest he would need to be coming at this in a completely different way. He would need to start by getting together key stakeholders and to begin the exploration from a non-party political platform. We would all need to enter into a process of co-creation where a shared Vision could be created and where we could explore to what extent we could align to a common purpose. If there is no identifiable ‘common purpose’ amongst the myriad of purposes that will inevitably be at play amongst each player/ stakeholder/ participant, then the initiative will simply fail. To use the metaphor of a Spinning Top: imagine the PURPOSE being the central axis, with the supporting players represented by the blue ‘i’s around the edge. If the players are balanced and aligned around the centre-point and focused on accomplishing the common PURPOSE, then when they put energy into it – as with a Spinning Top, it will spin erect with dynamical stability. 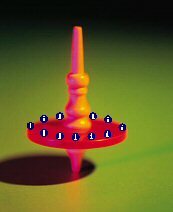 If any one of those Blue players starts prioritising another purpose that is outside of this Spinning Top, they will make it go off-balance and it will fall. In other words, if the players in a Project have counter-purposes (eg. party political agendas) then these will keep pulling the Project off course; or if the players supposedly supporting the common Purpose do not generate enough momentum because their energy and interest lie elsewhere, then this Top will struggle to get going and is unlikely to spin at all. The beauty of this metaphor is that no single one of the players around the edge can make the top spin by themselves. They need everyone working in synchrony to make it work. Democracy is not a goal, it is a path; it is not attainment, but a process. when we grasp this and begin to live democracy, then only shall we have a democracy. They may use words such as ‘collaboration‘ and ‘partnership‘ but rarely do they truly understand what these words mean in practice. And with a Purpose as big as David Cameron’s, it has to be co-created – people have to come to it, together. What he wants for his nation is irrelevant and unachievable. It is when we are unified about what we want that the energy for transformation becomes truly potent. The essential feature of a common thought is not that it is held in common, but that it has been produced in common.